Bingo Hearts | Play with £30 Bonus when you Join Now! Bingo Hearts has launched their site, with a beautiful re-design and exciting new Welcome Bonus. The site is operated on Cassava Enterprises and is part of the Dragonfish network. This online bingo site has a romantic and love-filled theme, with love-struck bingo ball cartoons gracing the background. The ‘new’ bingo site is a definite improvement from the previous site’s design! As soon as a player signs up to Bingo Hearts they can enjoy exciting bonuses. Immediately upon registering new players get a £30 Welcome Bonus with their first £10 deposit. 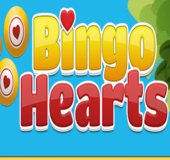 Players can then access all the exciting online bingo games and join the Bingo Hearts community in the fun chat rooms! There are exciting promos such as the Treasure Quest bingo game that play once a month! First, you have the chance to win free tickets to this game in the Treasure Free Tickets room. The best part is that for every ticket you buy to Grab a Grand you get one free for double the chance of winning! Bingo Hearts offers players an excellent bingo game selection! Players can enjoy a variety of 75-ball and 90-ball bingo games with exciting progressive and guaranteed jackpots. Players can win big in the thrilling Happy Hour games! There are also over 100 online slot games to choose from including the popular Starburst, Wizard of Oz, and Fluffy Favourites slots!